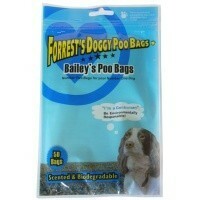 T Forrest Bailey's 50 Poop Bags are strong and durable bags which are ideal for convenient dog poo pick up and disposal. Keep the areas where you walk your dog clean and tidy using these specially made Bailey's poop bags. I like that the bags are black so they are not see through and they are a decent size. Unfortunately though for me I found the plastic to be too thin and although nicely scented this didn't cut it when the bag had been used.